Being a legendary off-road automobile, 4Runner has enabled motorists to successfully explore the outside, including the wildest terrain, for over three decades. 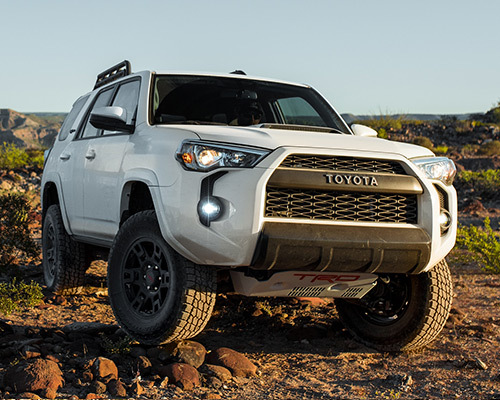 The latest Toyota 4Runner takes this iconic toughness to another degree with six different types designed for greater longevity, increased convenience, and technological connectivity. 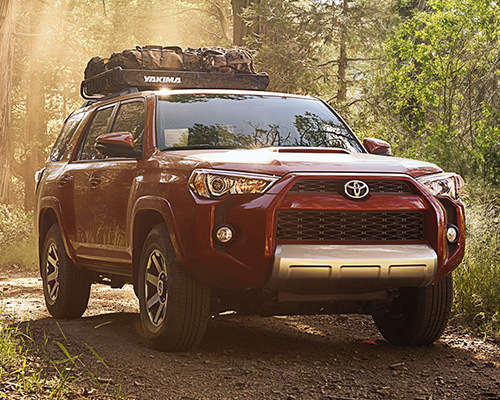 With several motor and trim packages to choose from, you can buy or lease from Bill Dube Toyota in Dover with confidence knowing the most fitting setup for the latest 4Runner is within your grasp. You will not have to worry about the stability of driving with two distinct four-wheel drive programs incorporating Active Traction Control (A-TRAC), Multi-Terrain Select that adjusts the motor throttle to regulate wheelspin, and Crawl Control (CRAWL) for ideal traction. This combination of power and handling means you are prepared to conquer any roadways or tracks. If you intend on getting the most out of your next outdoor excursion, it is safe to say you need a 4Runner from %Bill Dube Toyota in your driveway. Even though the 4Runner has a reputation for conquering everything from your day-to-day commute around Dover to a weekend in the great outdoors, that does not suggest this mid-size sport utility vehicle (SUV) must skimp on luxury interior upgrades. In fact, thanks to the addition of available heated and ventilated front seats, premium leather materials, active front headrests, and an available moonroof, there is no lack of reasons why the 4Runner will turn heads just as much on the inside as it does from the outside. Do you and your family not deserve to enjoy the finer things in life when it is time to buy or lease a new mid-size SUV in Dover? Are You Ready to Uncover Everything That Toyota's Impressive 4Runner Trim Levels Have to Offer? Thanks to a plethora of outstanding off-roading additions, the Toyota 4Runner Off-Road Premium stands as a SUV that has what it takes to conquer even the harshest of trails. Whether you are towing as much as 5,000 punds (lbs.) or leveraging add-ons, such as the locking rear differential and Hill Start Assist Control (HAC) to stay on track, there is no denying this top dog has you covered when the going gets tough. The only thing left to answer now is whether or not you are ready to buy or lease one today and truly seize control of your next commute. Are you into taking advantage of life's finer qualities? Whether you adore this mid-size SUV's dual zone automatic climate control, power tilt/slide moonroof (complete with sunshade), Entune Premium JBL Audio setup, or any of its myriad other spectacular additions, the story stays the same: The Toyota 4Runner Limited is most certainly your top choice if you intend on making the most of an unrivaled blend of elegant comforts and rugged resilience. Unparalleled performance is here to stay with the 4Runner TRD Pro on your side. Everything about the TRD Pro, such as its fashionable (yet pragmatic) black roof rack and FOX shocks that leverage TRD-tuned front springs, work as a team to give you the most enjoyable riding experience — from the asphalt to the dirt. The most exciting part? While all of these inclusions come together to allow for unmatched 4x4 functionality, they likewise do a great job of ensuring you draw attention no matter where the byways of Dover take you. 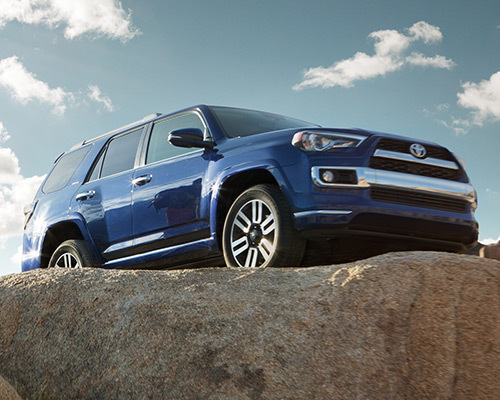 Cruising on assorted types of terrain is no issue when 4Runner, the latest mid-size SUV from Toyota, is designed to run on 270 horsepower (hp) and a torque capacity of 278 pound-feet (lb.-ft.) through the standard 4.0-L V6 engine. You may also stock up on any gear and supplies you will need for off-road outings with the ability to firmly tow a maximum of 5,000 lbs. Bringing your automobile in for routine maintenance plays a vital part in upholding maximum security, which is the reason why a free of charge two-year or 25,000-mile upkeep plan is included with your purchase or lease of the new 4Runner. The plan also incorporates 24-hour roadside support (unlimited miles), which you yourself can request by utilizing Safety Connect. Subscribers of this available system can also acquire help with locating their stolen 4Runner and alerting emergency units should you be caught in a collision. Just how frequently do you pull out your smartphone during the day to check on your email, look for something online, or look up what directions to take? Even when you are miles away from city life, 4Runner is your wireless connection to the rest of the online world by making hands-free phone calls, providing driving instructions at every intersection, and starting many different apps using the Entune App Suite — all on a 6.1-in. touchscreen displayed in high res. These apps include Destination Search to locate shops for gear, Facebook Places to find nearby places, and iHeartRadio to select your chosen radio stations. Wherever the trail leads you, your link with the outside world is handily inside your vehicle. All of the design elements and revolutionary properties of the 4Runner were meticulously selected to make sure your off-road traveling is a enjoyable, safe, and comfortable experience. Mapping out the next endeavor has endless possibilities when you are driving the newest 4Runner. See Bill Dube Toyota in Dover to buy or lease today.